​The international break is finally coming to an end which means the Premier League will be back soon! Fulham fans will welcome their players back to London, with the club needing a big finish to the end of the season to stand any chance of avoiding relegation to the Championship from the Premier League. Here is a quick roundup of all the things Fulham players got up to whilst on national team duty. ​The Fulham centre half played at left back for the USA in their 1-0 win against Ecuador in what was his first clean sheet since December, when Fulham stumbled to a 1-0 victory against Huddersfield. He also featured in the 1-1 draw with Chile, and the American must have enjoyed the international break, particularly given that he has Manchester City to look forward to next. ​Nordtveit played the full match as Norway pushed Spain all the way at the Mestalla but eventually lost 2-1 in their European Championship qualifier. It's fair to say the central defender on loan from Hoffenheim has not had the best of times in west London, having lost all four of the matches he has played in. Sergio Ramos added insult to this dismal record with his 'Panenka' penalty kick winner for Spain. Nordtveit was also involved in Norway's crazy 3-3 draw with Sweden on Tuesday evening, his side throwing away a 2-0 lead in the process. Ivory Coast had already confirmed their place in the upcoming Africa Cup of Nations and eased to a 3-0 win against Rwanda. Seri played the whole match and was on the winning side for his country, something Fulham fans will hope he can replicate after his underwhelming season with the Cottagers, who are without a victory since January. ​Fulham's record signing has failed to live up to his vast £30m transfer fee. The Cameroon international did play in a 3-0 win over Comoros which secured their spot in the Africa Cup of Nations. However, it remains to be seen what the future holds for a player whose four part name has perhaps been the most memorable thing about him this season. The standout player for relegation bound Fulham this season, the striker had a good international break with Serbia who picked up impressive 1-1 away draws against Germany ​in a friendly and Cristiano Ronaldo's Portugal in a qualifier. It looks certain that Mitrovic will have lots of Premier League clubs after him in the summer as Fulham prepare themselves for Championship football. Despite not featuring for Fulham this season, the 20-year-old started up front for his national side against Northern Ireland. Although the Northern Irish won 2-0, the young forward completed 90 minutes in a rare opportunity to play at a senior level.​ He also helped Estonia secure a 1-0 win over Gibraltar in an international friendly on Tuesday. ​It was bad news for Floyd Ayite and his Togo side as they lost a winner-takes-all clash with Benin and will not progress to the Africa Cup of Nations. Interestingly, Ayite became the second ever Togolese player to score a Premier League goal after Emmanuel Adebayor. A 'fun' fact for the suffering Fulham fans out there. 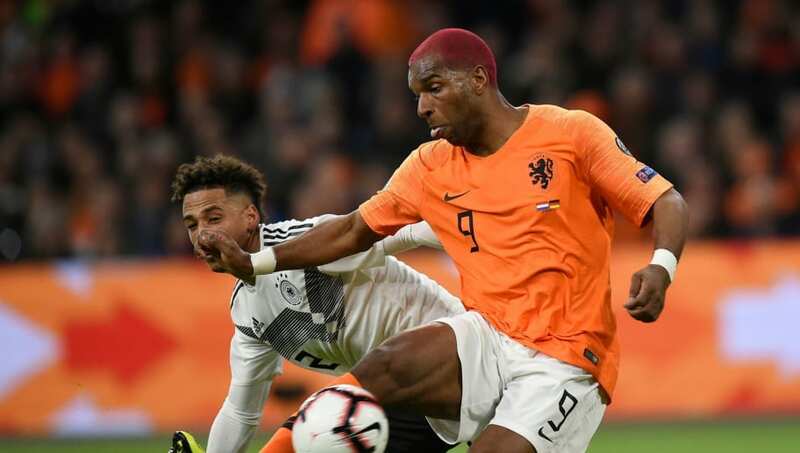 After joining the Cottagers in January on loan for the rest of the season, Babel has certainly impressed and has almost lived up to his flamboyant hairstyle. However, he did have big chances for Holland against Germany in their enticing European Qualifier. The misses proved costly as the Germans took all three points winning 3-2 away from home. He also started in the 4-0 win over Belarus. Fulham's 18-year-old whizz-kid was left on the bench for England Under-21s' 1-1 draw with Poland but was given a juicier role in the friendly with Germany in Bournemouth. He was deployed at left back and was substituted in the 81st minute as Aidy Boothroyd's side fell to a 2-1 defeat.